Thursday, March 07, 2019Stay Tuned for 2019 Aventurine Album Release Stay Tuned for 2019 Aventurine Album release on Biophilia Records! We shot a video with the wonderful people at Moonlasso Productions. 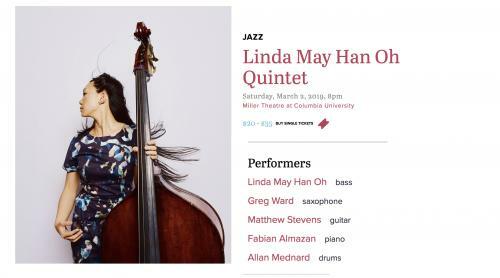 Wednesday, February 27, 2019Linda May Han Oh Quintet at the Miller Theatre!I'll be playing at the Miller Theatre at Columbia University Saturday March 2nd at 8pm with a great band, details below. 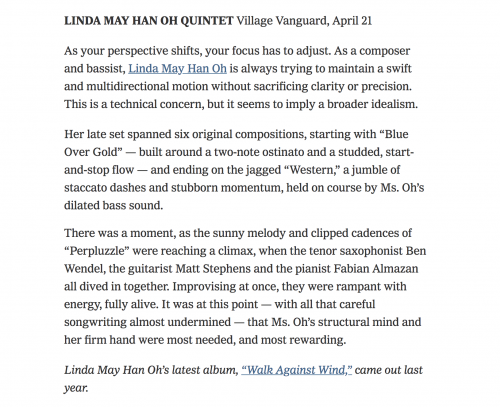 Monday, April 30, 2018NY TIMES Live Jazz: 5 April Standouts, From Andrew Cyrille to Linda May Han OhNY Times Shout out from our week a the Village Vanguard! 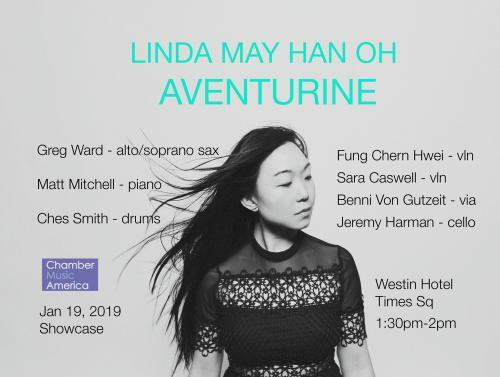 Monday, January 08, 2018Linda May Han Oh Aventurine at CMA Conference! 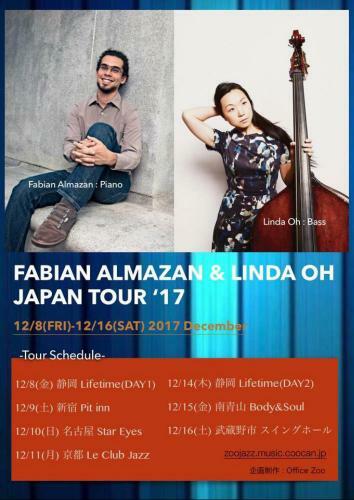 November 22, 2017Japan Dates Duo with Fabian Almazan! November 20, 2017December 2nd at the Fridge - Capital bop Series DCI'm really excited to be performing at the Capital Bop Series in DC - a traveling loft series at various inconventional venues. 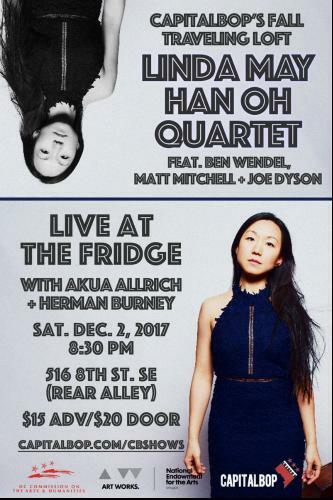 We'll be performing at the Fridge DC Art Gallery - a double bill at 8:30pm with Akua Allrich and Herman Burney Jnr. I'll be playing at 9:30pm with Ben Wendel, Matt Mitchell and Joe Dyson. I'll also be doing a free masterclass at 5pm! 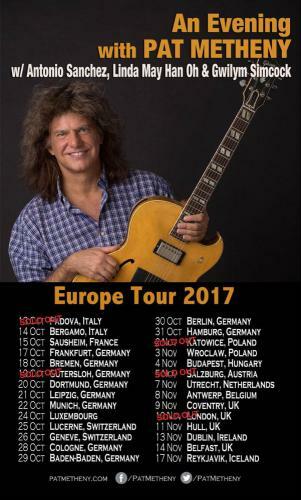 October 7, 2017Pat Metheny Fall 2017 Tour!Excited about these fall dates with Pat Metheny Quartet, with Antonio Sanchez and Gwilym Simcocl! April 18, 2017WALK AGAINST WIND Officially released!After a lot of time and team work, the Walk Against Wind is officially released! 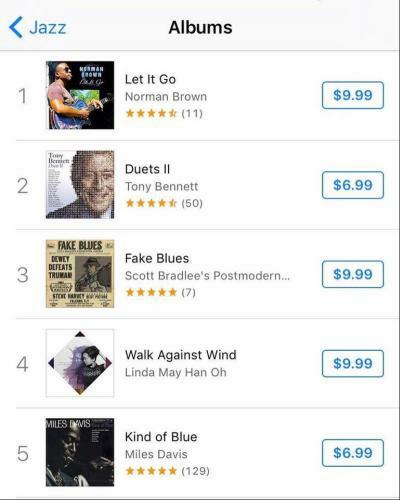 Reaching number 4 on the US iTunes Jazz charts, this features Ben Wendel, Matthew Stevens, Justin Brown and guests - Fabian Almazan and Minji Park. Get your copy now! We will also be celebrating at The Jazz Standard this Wednesday the 19th at 7:30pm and 9:30pm. 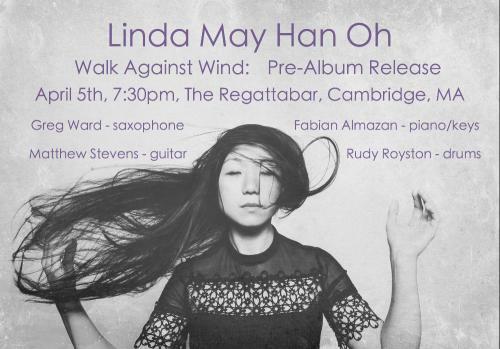 April 1, 2017April 5th Album Pre-Release @ The Regattabar, Cambridge MACheck out Linda May Han Oh Wednesday April 5th! With Greg Ward II, Fabian Almazan, Matthew Stevens, Rudy Royston. One set 7:30pm! October 24, 2016Thanksgiving Weekend @ The Jazz Gallery! 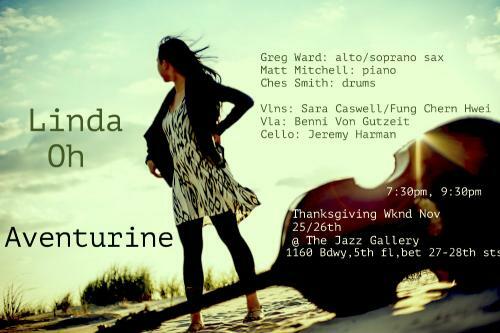 Nov 25/26thReally looking forward to playing my music with these fantastic musicians, hope to see you there! January 27, 2016SOUND PRINTS: LIVE AT MONTEREY JAZZ FESTIVALHere’s the first official release of Sound Prints led by Joe Lovano and Dave Douglas with myself, Lawrence Fields on piano and Joey Baron on drums. 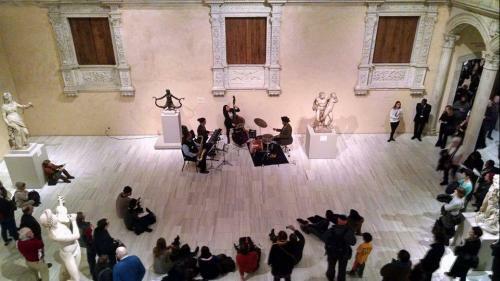 May 12, 2014Linda Oh group featuring Sirius Quartet May 23rd and 24th @ The Jazz GalleryOn the 23rd and 24th of May I’ll be playing my music at the Jazz Gallery with an eight piece group featuring the Sirius Quartet. I’m excited to be playing some new music as well as some older music that we had a played for my Jazz Gallery residency in April of 2012. 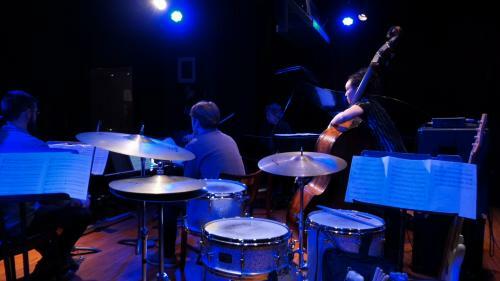 The group will be slightly different – featuring pianist Matt Mitchell (who I’ve had the opportunity of playing with quite regularly with the Dave Douglas Quintet) fellow Manhattan School graduate – Sara Caswell and drummer Ches Smith. Ches is featured on Matt’s duo record “Fiction” and we’ll be playing one of Matt’s etudes from that album orchestrated for this group. The other members include Greg Ward on alto/soprano saxophones, Fung Chern Hwei on violin, Ron Lawrence on viola and Jeremy Harman on cello. 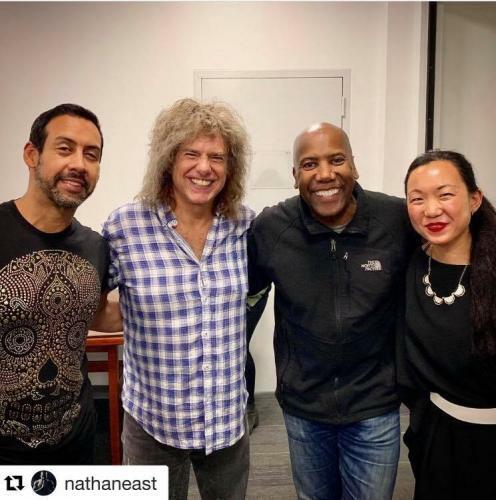 In December last year I had played at the Beijing Jazz Festival with saxophonist Jaleel Shaw and spent a bit of extra time checking out the scene there. While I was there, I asked vocalist Jen Shyu about some traditional musicians to check out and she gave me some excellent recommendations. I was lucky enough to meet a great musician – Liu Yu (刘禹) who welcomed me into his home and sung for me with his father playing sanxian. I also sat in at a community workshop conducted by Liu Yu and Jen’s teacher – Professor Zhang. The genre of shuo chang (说唱- literally “speak sing”) is something I know very little about, but I was so moved and impressed with the attention to detail. One thing I’ve noticed when listening to recordings of shuo chang and learning some of the melodies was how it strengthens a different part of melodic memory. So many of these melodies are long strings of notes, in many cases using a limited palette of notes within one main key and no time signature. Also, I know it would require a higher level of Mandarin to really get deeper into this music – my “restaurant” level of Mandarin only gets me so far, so I’m working on it. So much of this music is in the story telling. On the 23rd and 24th we’ll be playing some new material including a piece based on some melodic material from a traditional shuo chang piece “Song Yue Rao” or “Moon in the Pines” (松月绕). Another new piece we’ll be playing is called Deep Sea Dancers – inspired by the long strings of melodic material from some of the shuo chang I’ve been listening to. We played this piece with the Sun Pictures Quartet on our West Coast tour in April and I’m glad that I managed to finish orchestrating it for this group. We’ll be playing an arrangement of Charlie Parker’s Au Privave as well – this was kind of a bit of an experiment with what I could do with limited note choices. Anyways, enough nerdiness, hope to see you there at the Jazz Gallery.